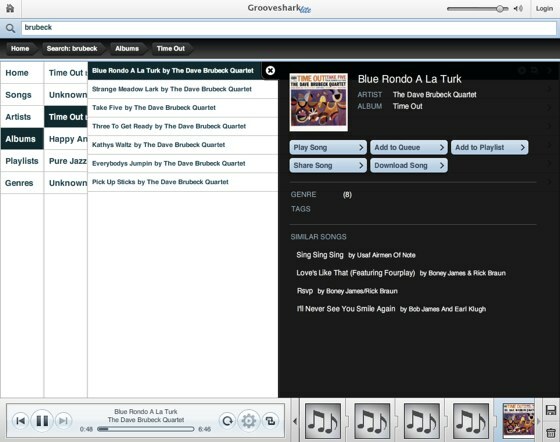 Music sharing and sales startup Grooveshark has launched Grooveshark Lite, a flash app that provides access to all the songs in Grooveshark’s library. For those unfamiliar with the company, Grooveshark allows users to upload and share their music collection with friends, but with a twist: every song uploaded can be purchased DRM-free with the uploader getting a cut of each sale (the rest goes to the record companies, and the service is 100% legal). The new Grooveshark Lite player is not dissimilar to what Last.fm offers, but without the silly restrictions like being able only play the single five times. It also helps that Grooveshark has a huge selection of music; I don’t have comparable numbers but Grooveshark returned better results on a couple of more obscure searches, where as Last.fm failed or only had 30 seconds of the song. Unlike Seeqpod, another service that allows you to search for and play music uninhibited (and until now my music service of choice), the music on Grooveshark is of a more reliable quality as it’s vetted for sale, although unlike Seeqpod you cant illegally download the track, if that’s how you like getting your music. The player offers music by artist, album and song title, and is free to use and doesn’t require registration, although registration is required to use Grooveshark services such as playlists and sharing.